My son recently had a birthday and for his special day he wanted a Minion Party based on the Minions from the movie Despicable Me. 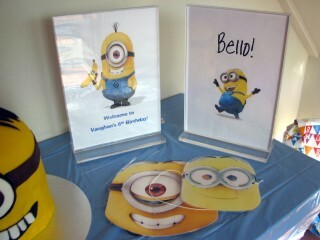 Here are some decorating ideas to use when planning your One in Minion party. I’ve included some PDF printables for you to download and use for your little person. To decorate, float yellow, latex, helium-filled balloons around your house. Using a permanent-ink marker, draw black goggles and blue overalls on each one, again resembling the minions. Make or buy yellow and blue bunting with minions printed on them or simply keep them plain. The colours will give the overall effect even without images. Find or make a unicorn/moon pinata. Fill it with yellow and blue sweets and minion themed toys. Look for posters from the movie on the walls in party area. You can then use them in your child’s bedroom after the event. Ask at your local movie theatre when the movie will no longer be showing and request any promotional decorations from them on that date. You may find they are happy to give you shaped cutouts, posters or other themed items. Find pictures of minions on the internet. Print the out and trim them. Stick them on the walls in the party space. A Simple invitation. Print out the details on a blue or yellow sheet of paper. Stick some minion stickers to it and the envelope (if you’re using one) and you are ready to go! Easy tank yu letter. Use blue or yellow paper with the words Tank Yu printed on them. have your child write a quick thank you note to his friends for gifts and attendance at the party. Decorative printables *(I used these at our party and although some have a lower resolution, they all looked fine on A4 size paper). Print out a few copies of these and place them around your party venue. We even had a lesson in speaking minionese using the language sheets. Now that you have all you need to decorate your venue, have fun using the colours to fill in the gaps. You don’t really need loads of minions, a few minion masks for the kids, along with the food and dress up clothes will make for a fantastic day. 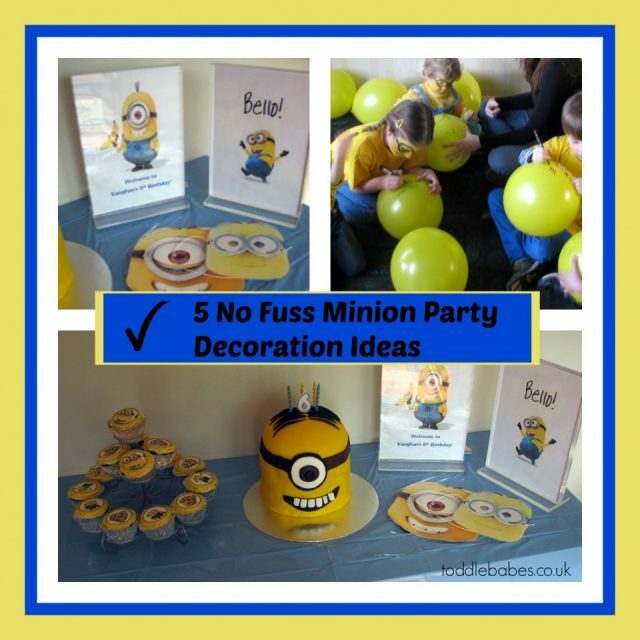 Take a look at my other minion party ideas on this blog for even more inspiration.